Shatrughan Sinha the mega star of the 70’s who gave a tough time to his contemporary stars like the ruling superstar of the 70’s Rajesh Khanna to the upcoming superstar Amitabh Bachchan has been a self made star and his rise from rags to riches is truly inspirational. In fact the South super Rajinikanth too owes his stardom to Shatrughan Sinha, whose style and dynamic mannerism Rajinikanth aped bluntly and even today acknowledges openly. 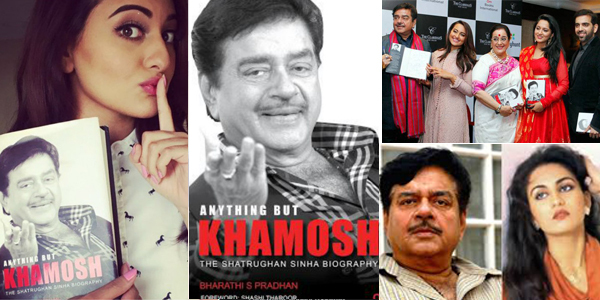 Shatrughan Sinha’s biography written by famous journalist Bharathi S Pradhan is aptly titled 'Anything But Khamosh because the biography daringly exposes the darker side of the actor turned politician. Another highlight of the biography is that it includes nasty comments from his critics because during his hey days Shatrughan Sinha was known for his arrogance, egotism, late schedules, flirting and pompous behavior. Speaking about the negative strides of his personality in the biography Sinha said, "Grey areas must be covered. If you don't do that then it becomes sycophancy. If I wanted I could edit comments by people who spoke against me but I didn't. It's a democracy so let them say whatever they have to say."